John C. Bultman was born circa 1884 at Illinois. He was the son of Henry F. Bultman and Dorathea (?). John C. Bultman married Christiana Kuester, daughter of (?) Kuester, circa 1905. [S244] U.S. Federal Census 1910 U.S. Federal Census, by Ancestry.com, ED147. Dwelling 62. [S243] U.S. Federal Census 1920 U.S. Federal Census, by Ancestry.com, ED7. Dwelling 22. Name Variation Christiana Kuester was also known as Christina. Married Name circa 1905 As of circa 1905,her married name was Bultman. Christiana Kuester was born circa 1898 at Illinois. She was the daughter of (?) Kuester. Christiana Kuester married John C. Bultman, son of Henry F. Bultman and Dorathea (? ), circa 1905. Christiana Kuester had 3 with 3 living in 1910 children. Name Variation Velma Bultman was also known as Nellena. Velma Bultman was born on 22 May 1905 at Minnesota. She was the daughter of John C. Bultman and Christiana Kuester. Henry Bultman was born on 24 April 1909 at Minnesota. He was the son of John C. Bultman and Christiana Kuester. Henry Bultman died in July 1973 at age 64. Henry Bultman obtained US Social Security Card at Illinois; last residence Grant Park, Kankakee, Illinois. Name Variation Lydia Lena Bultman was also known as Lidia. Lydia Lena Bultman was born on 12 August 1912 at Minnesota. Name Variation Arthur Ferdenand Henry Bultman was also known as Anthony. Arthur Ferdenand Henry Bultman was born on 14 December 1914 at Minnesota. Arthur Ferdenand Henry Bultman died in July 1985 at age 70. Arthur Ferdenand Henry Bultman obtained US Social Security Card at Illinois; last residence Watseka, Iroquois, Illinois. Name Variation Henrietta Nulph was also known as Harriet. Married Name 5 December 1851 As of 5 December 1851,her married name was Williams. Henrietta Nulph was born on 6 February 1833 at Mercer, Pennsylvania. She was the daughter of George Casper Nulph and Barbara Mercer. Henrietta Nulph married George Washington Williams on 5 December 1851 at Armstrong, Pennsylvania. Henrietta Nulph died on 11 March 1912 at Knowlton, Jeff Township, Ringgold, Iowa, at age 79. Free White Persons - 20 thru 49: 3. [S249] U.S. Federal Census 1850 U.S. Federal Census, by Ancestry.com, Handwritten number 582. Dwelling 315. [S246] U.S. Federal Census 1880 U.S. Federal Census, by Ancestry.com, NA Film Number T9-0362 Sheet 2C. Name Variation George Washington Williams was also known as G. Washington. George Washington Williams was born on 7 November 1827 at Maryland. He married Henrietta Nulph, daughter of George Casper Nulph and Barbara Mercer, on 5 December 1851 at Armstrong, Pennsylvania. William C. Williams was born on 3 April 1855 at Pennsylvania. He was the son of George Washington Williams and Henrietta Nulph. John E. Williams was born on 18 February 1863 at Iowa. Name Variation Asbury H. Williams was also known as Augustus H.
Asbury H. Williams was born on 16 February 1865 at Iowa. Catherine A Williams was born on 30 March 1867 at Iowa. She was the daughter of George Washington Williams and Henrietta Nulph. Married Name 28 June 1866 As of 28 June 1866,her married name was VanNatta. Mary Ann Polar was born in 1847 at Wisconsin. [S5] Wisconsin, Wisconsin Marriages, 1835-1900. [S246] U.S. Federal Census 1880 U.S. Federal Census, by Ancestry.com, ED107. Dwelling 166. Maggie VanNatta was born circa 1868 at Wisconsin. She was the daughter of Joseph H. VanNatta and Mary Ann Polar. Viola VanNatta was born circa 1870 at Wisconsin. Eli VanNatta was born circa 1872 at Wisconsin. He was the son of Joseph H. VanNatta and Mary Ann Polar. Delbert VanNatta was born circa 1874 at Wisconsin. James VanNatta was born circa 1876 at Wisconsin. Finney VanNatta was born in June 1879 at Wisconsin. Name Variation James R. Varuska Sr. was also known as Vavruska. Name Variation James R. Varuska Sr. was also known as Vince. James R. Varuska Sr. was born on 25 March 1876 at Tyndall, Bon Homme, South Dakota, tombstone listed as 1877; also reported as Mar 1877. He was the son of Frantisek Vavruska and Frances Pesa. James R. Varuska Sr. married Catherine Schaffhausen on 8 February 1898 at Tabor, Bon Homme, South Dakota. James R. Varuska Sr. died on 5 December 1954 at age 78. He was buried after 5 December 1954 at Pleasant Lawn Cemetery, Charles Mix, South Dakota. [S245] U.S. Federal Census 1900 U.S. Federal Census, by Ancestry.com, ED79. Dwelling 54. [S244] U.S. Federal Census 1910 U.S. Federal Census, by Ancestry.com, ED96. Dwelling 56. [S243] U.S. Federal Census 1920 U.S. Federal Census, by Ancestry.com, ED47. Dwelling 90. [S250] U.S. Federal Census 1930 U.S. Federal Census, by Ancestry.com, ED20. Page 4A. [S9] South Dakota, South Dakota Birth Records South Dakota, State File Number: 571059 (unknown file date). Name Variation Catherine Schaffhausen was also known as Katie. Name Variation Catherine Schaffhausen was also known as Schaufhausen. Name Variation Catherine Schaffhausen was also known as Katherine. Married Name 8 February 1898 As of 8 February 1898,her married name was Varuska. Catherine Schaffhausen was born on 19 February 1879 at Tyndall, Bon Homme, South Dakota. She married James R. Varuska Sr., son of Frantisek Vavruska and Frances Pesa, on 8 February 1898 at Tabor, Bon Homme, South Dakota. Catherine Schaffhausen died on 19 April 1955 at age 76. 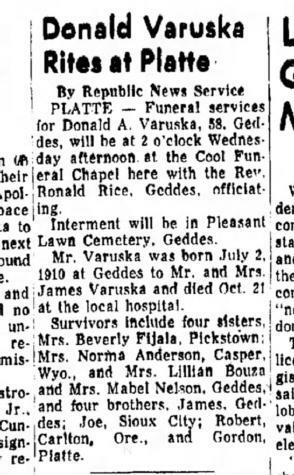 She was buried after 19 April 1955 at Pleasant Lawn Cemetery, Charles Mix, South Dakota. Catherine Schaffhausen had 4 with 4 living in 1910 children. Children of Catherine Schaffhausen and James R. Varuska Sr.
Donald Archibald Varuska was born on 2 July 1910 at Geddes, Charles Mix, South Dakota. He was the son of James R. Varuska Sr. and Catherine Schaffhausen. Donald Archibald Varuska died on 21 October 1968 at South Dakota at age 58. He was buried after 21 October 1968 at Pleasant Lawn Cemetery, Charles Mix, South Dakota. Robert H. Varuska was born on 22 March 1914 at South Dakota. Robert H. Varuska died on 24 March 1992 at age 78. Robert H. Varuska obtained US Social Security Card at Oregon; last residence not specified. Name Variation Gordon F. Varuska Sr. was also known as Gorden. Gordon F. Varuska Sr. was born in 1917 at South Dakota. Gordon F. Varuska Sr. married Alice L. Fox, daughter of Frank Corey Fox and Ella M. DeLong, on 29 July 1940 at Boyd, Nebraska. Gordon F. Varuska Sr. was buried in 1999 at Pleasant Lawn Cemetery, Charles Mix, South Dakota. Married Name 16 May 1942 As of 16 May 1942,her married name was Adams. Married Name Her married name was Fiala. Married Name Her married name was Fijala. Beverly Fern Varuska was born on 3 May 1923 at Geddes, Charles Mix, South Dakota. She was the daughter of James R. Varuska Sr. and Catherine Schaffhausen. Beverly Fern Varuska died on 11 January 1999 at age 75. Married Name 1 April 1925 As of 1 April 1925,her married name was Bouza. Lillian Varuska died in January 1987 at age 85. She was buried after January 1987 at Pleasant Lawn Cemetery, Charles Mix, South Dakota. Lillian Varuska obtained US Social Security Card at South Dakota; last residence Platte, Charles Mix, South Dakota. [S9] South Dakota, South Dakota Birth Records South Dakota, State File Number: 777391 (unknown file date). [S250] U.S. Federal Census 1930 U.S. Federal Census, by Ancestry.com, ED12-20. Dwelling 82. John Harold Neef married Grace (?). John Harold Neef was born circa 1877 at Wisconsin. [S243] U.S. Federal Census 1920 U.S. Federal Census, by Ancestry.com, ED345. Dwelling 30. Married Name Her married name was Neef. Grace (?) married John Harold Neef. Grace (?) was born circa 1883 at Wisconsin. Marian Neef was born circa 1915 at Washington. She was the daughter of John Harold Neef and Grace (?). June Neef was born circa October 1919 at Washington.